Delaware County History: Marcus Hook Firemen Happy!! 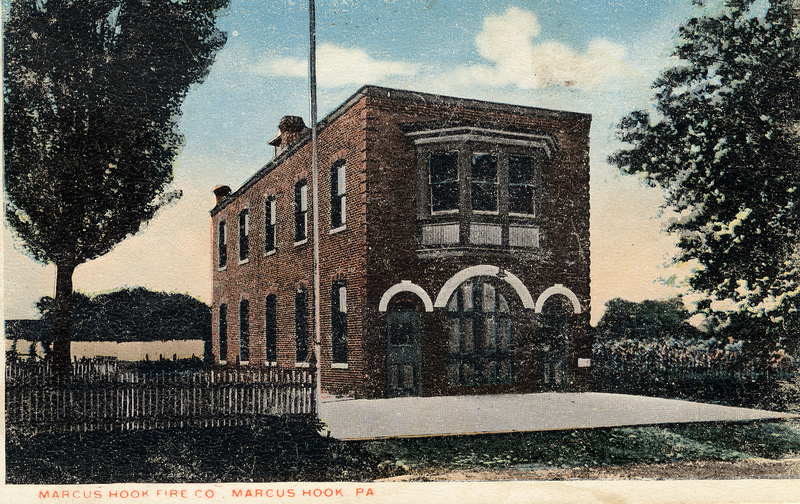 The Marcus Hook Fire Company on 10th St. about 1920. The fire company started in 1903. Note: Over 100 years ago, all the local fire companies began receiving motor driven fire trucks and it was front page news!! With the exception of the Chester City Fire Cos. and Radnor who were horse drawn, all other local fire companies were pulled by hand. If you have seen a picture of a local fire company over 100 years ago, at a parade being horse drawn, it was common for local businesses to lend their horses to the fire companies for special occasions. Getting a motor driven fire truck was a big deal. Of course it also caused problems. The small trucks could only carry a small portion of any local fire companies membership and only senior members usually got to ride while other members ran along side and behind. The handsome new motor-driven triple combination fire engine ordered from the American-LaFrance Fire Engine Company, Elmira, N. Y., by the Marcus Hook Fire Company arrived in the borough on the Pennsylvania Railroad yesterday and was greeted by not only the members of the company, but also by a large crowd of the residents. The engine was run under its power from the Pennsylvania Railroad yard to the Fire Company’s building on Market Street, and its appearance was hailed with shouts and cheers. It appeared as if the entire borough had turned out to welcome this new machine, while a number of automobiles followed in its wake from Market Street. With clanging bell and siren whistle sounding the engine drew up in front of the fire headquarters and was backed in where it underwent an inspection by hundreds who admired its beauty. The engine is painted white with colored trimmings. The metal work is silvered over. This combination gives the machine a fine appearance. The engine is guaranteed to pump seven hundred and fifty gallons of water a minute and carries twelve hundred feet of hose, also a twenty-four feet extension ladder and a twelve-foot roof ladder. The agent of the American-LaFrance Company is B. C. Street; the demonstrator is William Bell. Mr. Bell will remain with the engine until whoever the Fire Company appoints as driver is qualified to manage the machine. The amount of money paid for the engine was $8,500, and not only the members of the Fire Company, but the greater majority of the residents as well, consider the money well invested. The American-LaFrance Company has a high reputation for manufacturing first-class fire engines, and this new acquisition of the local Fire Company is not an exception to this high standing. It is considered one of the best ever turned out by the American-LaFrance Company. A thorough test of the engine will be given the latter part of this week, the time of which will be printed in the Marcus Hook column, then all can see what superior work the new engine is capable of doing.